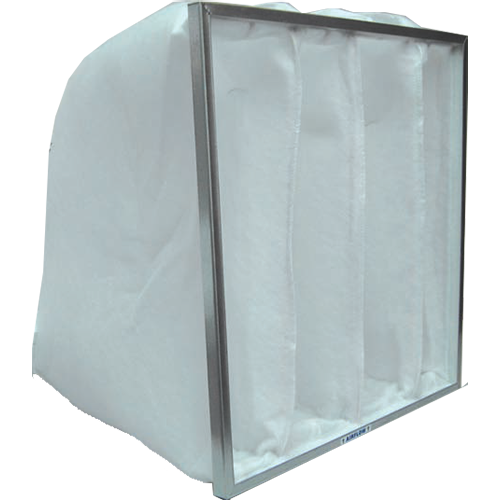 This bag filter is a medium efficiency, extended surface area filter that combines high levels of dust holding with low levels of resistance, these features ensure that the product is ideal for use within all applications where low replacement frequency is required. The media is manufactured from thermally bonded, lofted, synthetic fibre that provides an F1 fire resistance to DIN 53438, making this Bag particularly appropriate for use in the Food, Pharmaceutical and Electrical industries. The pocket assembly is contained within a sturdy galvanised channel frame with the corners mitred and braced. For maximum safety a rolled edge is featured on all internal parameters of the frame.